We keep you updated daily with free samples, competitions, discount codes, vouchers, coupons and much more. Wow, visit us today for the latest offers! 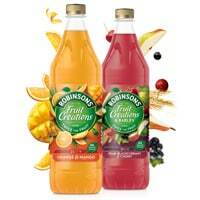 Robinsons is giving away free £1 coupon for Fruit Creations. Just follow our link and click on Claim button and then get your coupon which can be redeemed from any nearest store. Click on “GET IT HERE” button and then follow instructions given above to get a free money-off coupon. Copyright © 2018 Wow Free Stuff. All Rights Reserved.